Earlier this year "The Mexican Russian" Evgeny Gradovich (17-0, 8) announced himself on to the world stage by getting a chance to fight for a world title, and taking it. Gradovich, who had only gotten a chance due to a late pull out by Cuban Luis Franco, went out and performed as if his life depended on. On that night Gradovich took on Australian Billy Dib (36-2-0-1, 21), then then reigning IBF Featherweight champion, and upset Dib taking a split decision over the experienced Aussie. 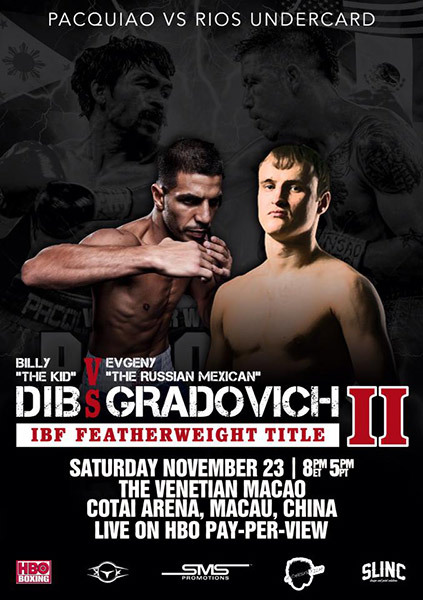 The two men will meet for a second time in little more than 8 months as Gradovich seeks the second defense of the beat he took from Dib whilst Dib hunt revenge over the man who took his world title. Unlike the first bout, which took place as the headline fight of an ESPN Friday Night Fights, this one takes place on the massive undercard of Manny Pacquiao v Brandon Rios, a card in Macau that the world will be tuning in for. A show that will have the world's attention a show that will help define the two men for the foreseeable future. With such a big potential audience this bout really does leave the fighters looking to prove a lot. For Dib he'll be looking to prove that it was an off night the first time around, a fluke victory for Gradovich. On the other hand Gradovich will be looking to show that he is a genuine world level fighter, not just a title holder who beat an off colour champion. This will see both men fired up and both men looking to put it all on the line in the search for victory. Dib, at his best, is a talented boxer. He's not a big hitter but he can sting an opponent with clean shots, he has decent hand speed, decent movement and likes to control the pace and distance of a fight. At his worst however the Australian is nothing short of a nightmare to watch holding, pushing down and generally making things incredibly messy. Although often a messy and criticised fighter Dib is seemingly a permanent fixture in the world rankings. He has so far fought in five world title fights, losing two of those and winning the other three. Despite that record in world title fights he has yet to beat a genuinely proven world level fighter, in fact his most notable victory is probably a 6th round retirement over Eduardo Escobedo. Whilst Dib is a boxer it's fair to say that Gradovich is a bit more of a brawler. The Russian doesn't look to find gaps with movement and defense but instead looks to force a fight with an all action style, a never ending barrage of punches and unrelenting pressure. Gradovich's work isn't always the smoothest or the cleanest but it is non-stop as he attempts to grind down and beat up his opponents. With just 17 fights of professional experience experience behind Gradovich it'd be easy to call him inexperienced though that's far from accurate. The Russian has fought in 150 amateur fights and countless rounds of sparring in the Roberto Garcia gym in Oxnard with numerous rounds sparred with world class fighters. In fact it's probably fair to say that Gradovich, who shares a gym with the likes of Mikey Garcia, Brandon Rios and Marcos Maidana, has learned more in the gym than he has learned in his professional contests. His development over Garcia has been phenomenal. Going on their last performances the two men are heading in different directions. Gradovich abused Argentinian Mauricio Javier Munoz in a very one sided bout, in fact it was a bout that saw Munoz almost becoming a heavy bag for Gradovich. Dib's last contest however saw him escaping with a majority decision over Mike Oliver, a man who hadn't fought in almost 2 years following a second round blast out to Juan Manuel Lopez. The fact Gradovich won last time out and seems to be getting better whilst Dib is getting worse makes it hard to see anything but a repeat result here. Dib may manage to make life difficult for the Russian but it's hard to see anything but a victory for the unbeaten Russian who appears to be one of the sports most over-looked world champions.